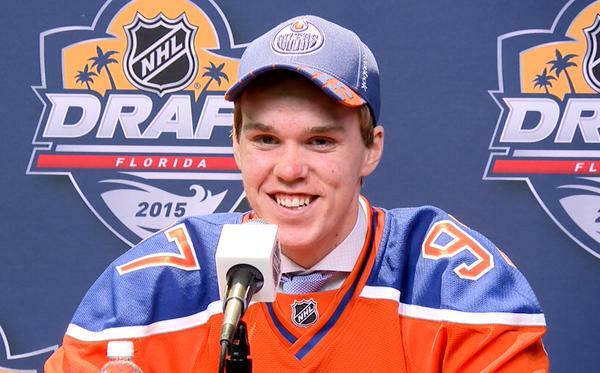 The hype for Connor McDavid is real… real annoying. The NHL views him as their star, their very marketable star. Not since Sidney Crosby back in 2005 has the hype for a player been like this, and the NHL is not letting up. Through 6 games McDavid has 5 points, impressive, but not for the amount of press this kid is getting. Other rookies such as Artemi Panarin (7 points), Anthony Duclair (4 goals), Max Domi (6 points), Dylan Larkin (6 points) are having just as successful seasons but haven’t been getting half the attention. Just last week Duclair netted his first NHL hat trick, but didn’t make the NHL’s top plays of the week. Instead #3 on the list was McDavid’s first NHL goal, a tip in. Meanwhile, Larkin has had points in each of his first 5 NHL games, but there is no mention. Brock McGinn scored his first NHL goal 55 seconds into his first NHL game, and there was nothing more then a brief mention on NHL tonight. Oscar Lindberg scored on his first shift and first shot of his NHL career, and as expected… barely anything. We get it, McDavid is the star of the future, but there are other NHL players too, some pretty good ones in fact if you happen to take a look outside of Edmonton. It is hype like this that builds up a player to the point where no matter what he does, he cannot come close to reaching those expectations. Fans are already comparing him to Wayne Gretzky, The Great One, the same guy who if you disregarded all his goals he STILL holds the record for most career points. This isn’t an indictment of his skill or caliber. The kid is going to be good. But like all ‘next great players’ in any sport, it will take time for him to get there and the NHL marketing of him should follow suit. So calm down everyone; take a breath. Let’s all pump the brakes, sit back, and watch to see what this kid can do. Next Article » The Fighting Irish: Can Joe Duffy take down McGregor?